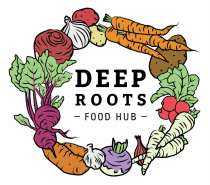 The Deep Roots Food Hub (DRFH) is a grassroots, West Carleton-based non-profit organization that aims to create a secure, sustainable food system in West Carleton. DRFH partners and supporters include the Ottawa Good Food Box, Centretown Community Health Centre, EnviroCentre, the Western Ottawa Community Resource Centre, the West Carleton Family Health Team, Carp Ridge Eco-Wellness Centre and the Community Foundation of Ottawa. offer educational workshops on topics such as cooking, nutrition, food gardening, canning and preserving, and home root cellaring. Deep Roots Food Hub (DRFH) is made up of a passionate team of local farmers, market gardeners, health professionals, business people, and residents of West Carleton. Despite coming from all different walks of life, they all have the same goal in mind: to develop programs that will make it easier for all residents to access, grow, and sell affordable, healthy food.